Hot Swap - change probes without powering down the instrument. Fast and easy! 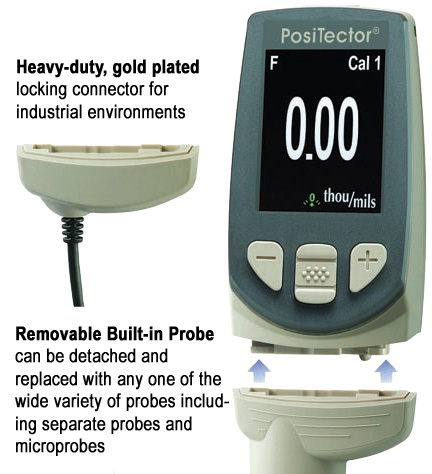 Probe Settings Retention - PosiTector bodies remember the stored settings of each probe! USB port for fast, simple connection to a PC & to supply continuous power. USB mass storage - stored readings and graphs can be accessed using universal PC/Mac web browsers or the explorers. No software required. 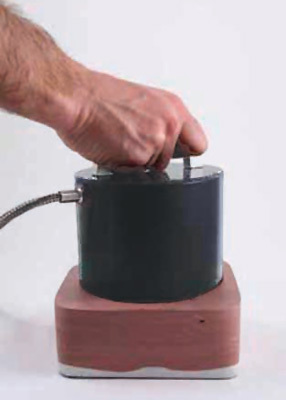 Ferrous probes measure non-magnetic coatings on ferrous metals. Non-ferrous probes measure non-condutive coatings on non-ferrous metals. **FNGS probe measures non-conductive coatings on all metals. ***Accuracies are stated as a fixed value plus a percentage of the gage's actual reading. 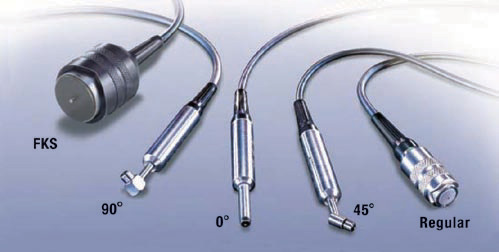 EXTENDED CABLES available for underwater or remote measuring. Specify length when ordering. 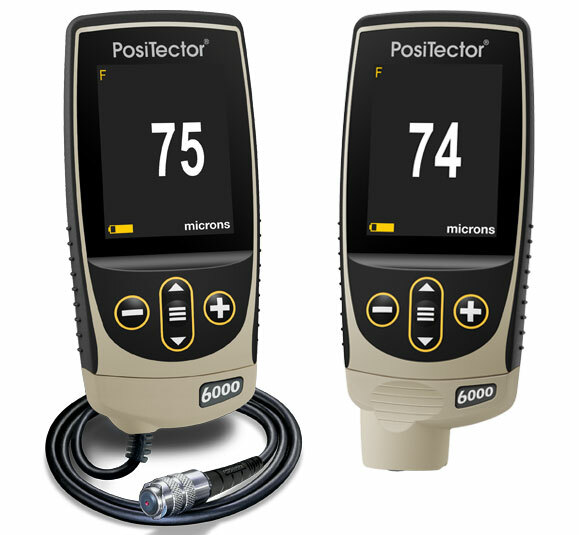 The PosiTector 6000 FHXS Xtreme™ coating thickness gage for measuring coatings up to 400 mils (10,000 microns) thick in rugged environments. 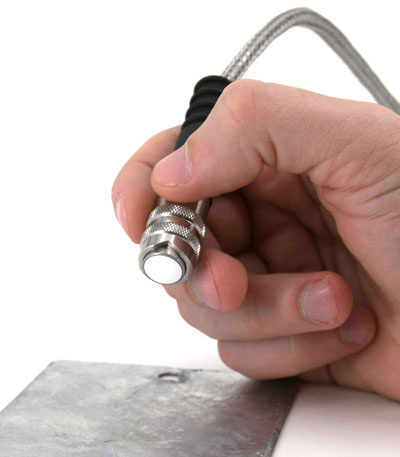 Designed with an alumina wear face and braided steel cable, the PosiTector 6000 FHXS is ideal for measuring on hot or rough surfaces. 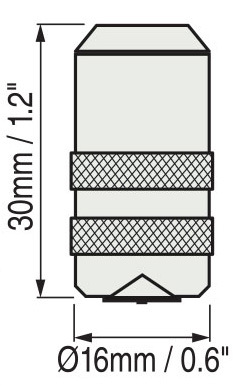 Ability to measure on hot surfaces up to 250°C (500°F). Robust aluminum probe large enough to use with gloves. 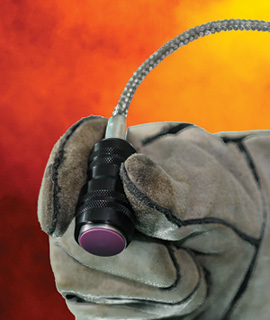 Designed for hot rugged applications. 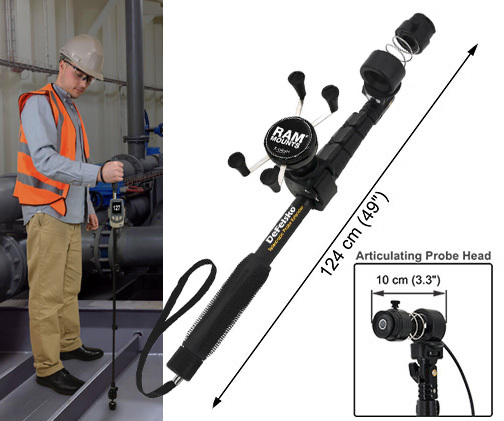 The FXS Xtreme™ probe features an improved zirconia-toughened alumina wear face and a new braided steel cable making it ideal for harsh conditions and continuous measurement on hot surfaces up to 500°F (250°C) . Enhanced measuring speed of 50+ readings per minute makes it ideal for measuring large, rough surfaces quickly. 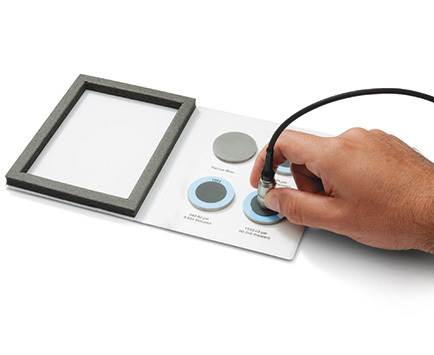 Scan mode increases measurement rate to over 100 readings per minute (PosiTector Advanced only). Compatible with PosiTector bodies with serial numbers greater than 700,000. *Accuracies are stated as a fixed value plus a percentage of the gage's actual reading. The S4 Certified Coated Metal Plate Standard is ideal for verifying the accuracy and operation of the FXS Xtreme probe. The S4 Standard features four epoxy-coated steel plates with nominal coating thicknesses of 0, 75, 1000, and 1900 µm (0, 3, 40, and 75 mils) mounted in a protective binder. This standard is ideal for the PosiTector 6000 FXS probe's increased range of 0 - 2000 µm (0 - 80 mil). Certified coating thickness standards are an important component in fulfilling both ISO and in-house quality control requirements. 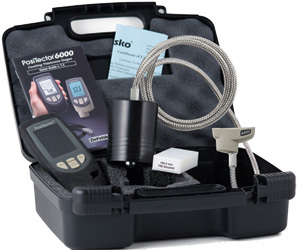 Many organizations require verification of gage accuracy at the test site each time a coating thickness gage is put into service and at frequent intervals during use. Ideal for this purpose, S4 certified coating thickness standards have measured values traceable to a National Metrology Institution. 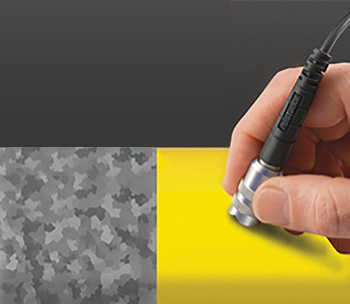 The PosiTector 6000 III FNDS probe measures the individual thicknesses of both the paint and the zinc layers in a duplex coating system with a single reading. Duplex coating systems use a combination of two corrosion protection systems - typically paint or powder coating over galvanized steel (hot-dip, electro or zinc spray metallizing). The resultant corrosion protection is superior to either protection system used independently. In Duplex mode, the PosiTector 6000 III FNDS utilizes both magnetic (ferrous) and eddy current (non-ferrous) principles simultaneously to calculate and display the individual paint and zinc layer thicknesses. 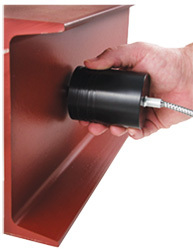 The magnetic principle is used to measure the combined paint/zinc thickness over the ferrous substrate, and the eddy current principle is used to measure the paint thickness over the non-ferrous zinc coating. 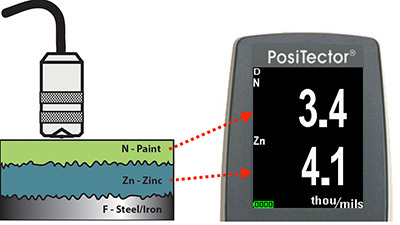 The zinc thickness is calculated by subtracting the paint thickness from the combined paint/zinc thickness measurement. When disabled, the gage will operate like a conventional combination ferrous non-ferrous instrument (similar to PosiTector 6000 III FNS probe). Ideal for measuring non-magnetic coatings over steel and non-conductive coatings over non-ferrous metal substrates. 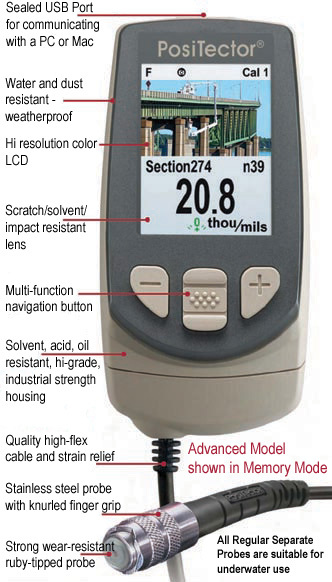 Compatible with all PosiTector Advanced and PosiTector Standard gage bodies with a color display. A Simple gage update may be required. 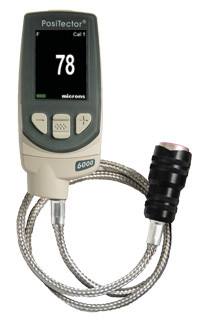 The PosiTector 6000 F90ES probe features a 12 x 5mm (0.48" x 0.2") probe head with 350mm (13.75") reach. It is ideal for measuring hard-to-reach areas and other challenging applications such as tight diameters, edges, and corners. Probe Foot Rings are ideal for use on thin, soft coatings. 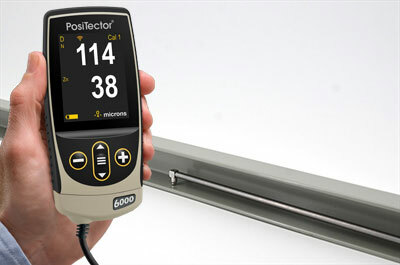 Lightweight, portable device increases the reach of PosiTector 6000 regular cabled probes up to 49" (124 cm), ergonomically measuring overhead or underfoot. Includes a built-in mount for securing the PosiTector gage body allowing for comfortable one-handed operation. 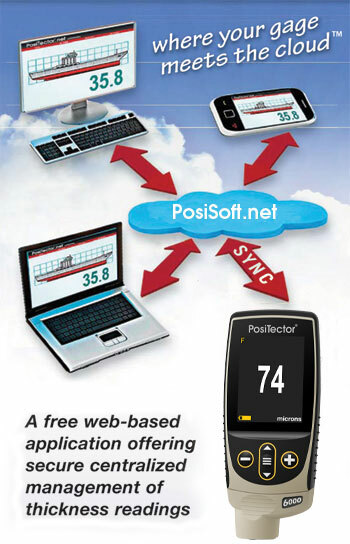 PosiSoft Mobile is a gage-based software application featured in all PosiTector Advanced instruments. PosiSoft Mobile can be accessed from any WiFi enabled device using a standard web browser. 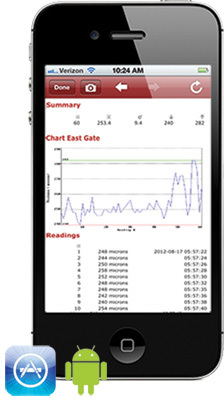 PosiSoft Mobile Manager - Easily find all your WiFi enabled PosiTectors and launch PosiSoft Mobile with this handy app. Available as a free download in the Apple App Store and Google Play. 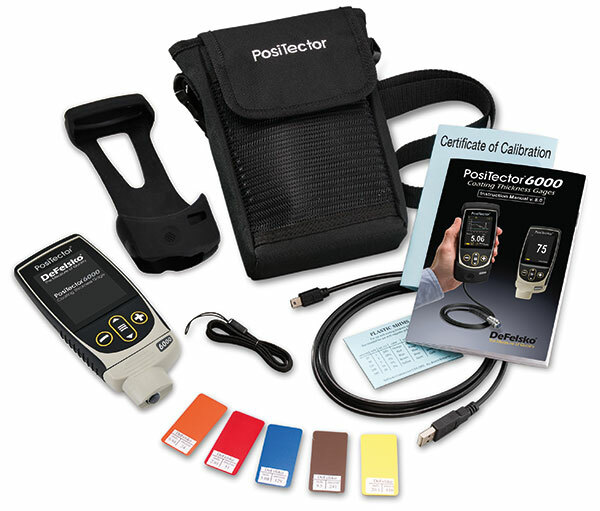 PosiTector® Inspection Kits, that include all three probe attachments and more, are now available click here for more information.